She brightens our dreariest days. Annie always brings a smile to my face. Such a beauty! Oh, those thighs! I wish my *ehem* thicker thighs were that cute (or cute at all..). LOL. She’s adorable and might I say looks so much like you in this one! Gorgeous, gorgeous loving girl with a marvelous smile! Wow, gorgeous. She rocks the yellow! How could you not smile at that face, she’s so beautiful! All the cute pictures of her brighten my days!!! 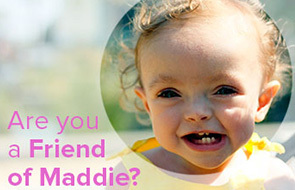 She is a beautiful “love bug” whom anyone can refuse to LOVE and ADORE HER…..Just like her big sister, Maddie! She is such a beautiful baby. She has gotten so darn big, SO fast! And she’s as adorable as ever. =o) Though I know she’ll get more beautiful day by day. I’ve been neglecting reading my favorite blogs for awhile now, and I’m going to stop and be more dedicated. Especially to this one. There’s so much goodness that I missed, that I’m only catching up on now.